By the Squaw Valley Aerial Tram the non-smoking Plumpjack Squaw Valley Inn offers a modern take on a classic ski chalet experience with an outdoor pool sumptuous breakfast buffet and ski in/ski out access. This mid-rise resort has 56 rooms plushly decorated with traditional style and contemporary appeal. Rooms feature fluffy duvets free Wi-Fi DVD players flat-panel TVs coffeemakers and iPod docks. Your pup also gets a comfy bed as well a doggy bowl and snacks for an additional fee. Wake up to a hot breakfast buffet and come home to lunch and dinner at the happening on-site cafe. Warm up in the fitness room and relax in the outdoor hot tub open year round or by the outdoor pool open in the summer. Ski storage and rentals are available. Parking is free. 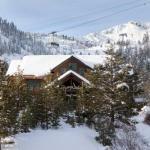 Home of the 1960 winter Olympics Squaw Valley is prime country for skiing and snowboarding. In the summer take an Aerial Tram from the Village two blocks away for a spectacular view and lofty mountain ride. Hike the trails around Lake Tahoe eight miles away or get some beach time on the quiet shores of Donner Lake in Truckee about 20 minutes away. Reno/Tahoe International Airport is 48 miles away.